Elizabeth Ellicott Lea's recipe for Pine Apple Syrup was "to season ice cream." 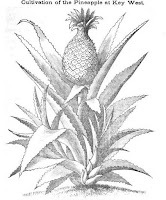 Mary Randolph's Virginia Housewife included a pineapple ice cream recipe as did the British author Nutt in 1819. 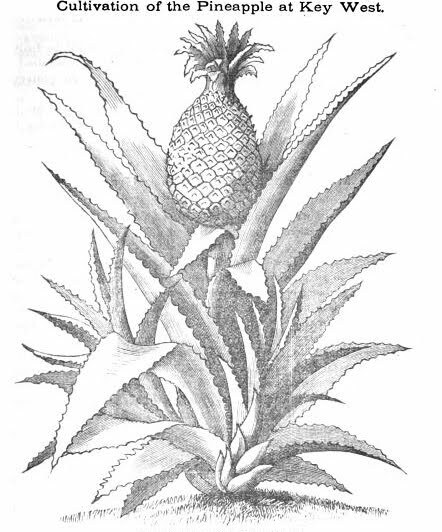 The 1749 article on ananas (pineapple; below) may have been read by George Washington or Charles Carroll, Barrister, of Baltimore who each had a pinery to grow the expensive plant before 1800. Incredible picture of selling some of the "35,000 pines" that arrived at London in 1847 on one ship. 1749 image of pine apples and cacao tree. A cargoo of this hitherto valuable and delicious fruit, consisting of the immense quantity of 35,000 Pines, has, within these few days, been received by the Trinity yacht, Captain Hounsell, in twenty-five days from New Providence, consigned to Messrs. Keeling and Hunt, Monument-yard; this being the largest quantity of Pines ever brought, at one time, to this country. 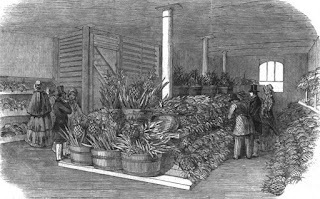 A portion of the fruit was brought on the deck of the vessel, growing in the soil in which it was originally planted; and, as exhibited in the different floors at the warehouses of Messrs. Keeling and Hunt, gave them the appearance of huge pineries. This firm received, previous to the above cargo, upwards of 30,000 Pines, by steamers and sailing vessels; the whole of which went rapidly into consumption; and the annual supplies are now looked forward to anxiously by the public, who apply the fruit to preserving purposes, as well as dessert. The bulk of this fruit is brought from the Bahamas, where the Americans, to the period of the first importations to England, enjoyed the exclusive purchase of the fruit from the natives; but, since the English have been in the market, the Pines have advanced 50 to 60 per cent. in value. The Pine plants in the West Indies only bear for three years; and those of the last of the three years' growth are sent on the trees to England, and thereby make room for other plantations. As Pine-apples are becoming economical luxuries, it may be useful to state that they may be kept a considerable time by twisting off their crowns; which are often suffered to remain and live upon the fruit, till they have sucked out nearly all the goodness.